It's common (best practice, actually) to have multiple copies of a site for development, staging, production, etc. Ideally you want to use the same code on all the sites. This can lead to an analytics problem -- having data from the dev and staging sites pollute the production data. One approach to dealing with this is to add a filter to the analytics profile to remove any data coming from the staging or dev servers. In brief, if we're on our staging server, don't set the web property ID . This results in the tracker using a default ID -- something like "UA-99999-9". The analytics code functions normally, but any data is sent to the default web property ID. This is nice because it's possible to verify that the analytics code is working. Note: I used to put the conditional on the _trackPageview call -- The problem with this is that other analytics code (like _trackEvent, etc) will still be sending data. The Raspberry Pi is a great little device. While it's possible to do compiles on the platform, because of limited memory/CPU, for bigger binaries it's faster to work on my regular desktop box. I'm using crosstool-NG to build a toolchain for cross compiling binaries for the Raspberry Pi. Looks like the the eglibc folk don't provide tarball releases, so svn is required to fetch eglibc. Installed Subversion, and had a successful build. I've got a new printer in the works -- a Delta robot based on the Rostock by Johann Rocholl. I wrote this post to help me get my mind around the differences between traditional 3D printers vs Delta robots, and the math involved in figuring out movement. 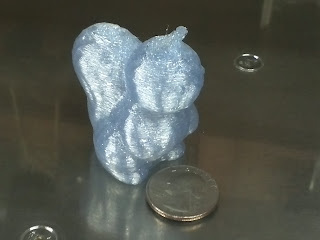 What I find interesting is that with a Delta bot, the resolution changes depending on where you are on the print bed. With printers that use a Cartesian coordinate linear motion system (i.e. 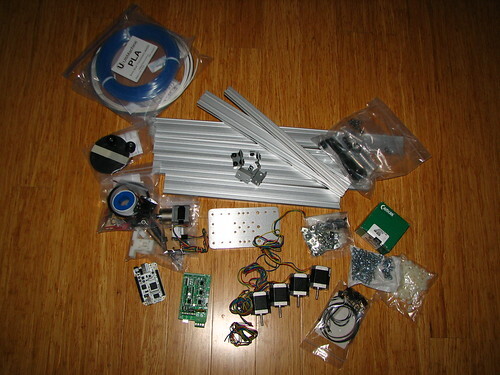 X, Y, Z motors), the resolution of the printer is the same no matter where you’re printing. For example, my ORDish Bot printer has a resolution of approximately 53 steps/millimeter on both the X & Y axis, and 2015 steps/millimeter along the Z. Looking at a single arm of a Delta Bot, one end of the arm moves up and down (attached to some form of linear motion element), and the other end moves horizontally (attached to a print head). This forms a right triangle, with the arm as the hypotenuse. The hypotenuse length is fixed, and the length of either side can be calculated from the other via the Pythagorean theorem. A little playing around with the Pythagorean theorem shows that a 1mm vertical movement at those points results in print head movements of 0.87mm, 1.76mm, & 4.69mm. Using the same pulley/belt/motor combo as my ORDish bot translates to resolutions of 60, 29, 11 steps/mm. 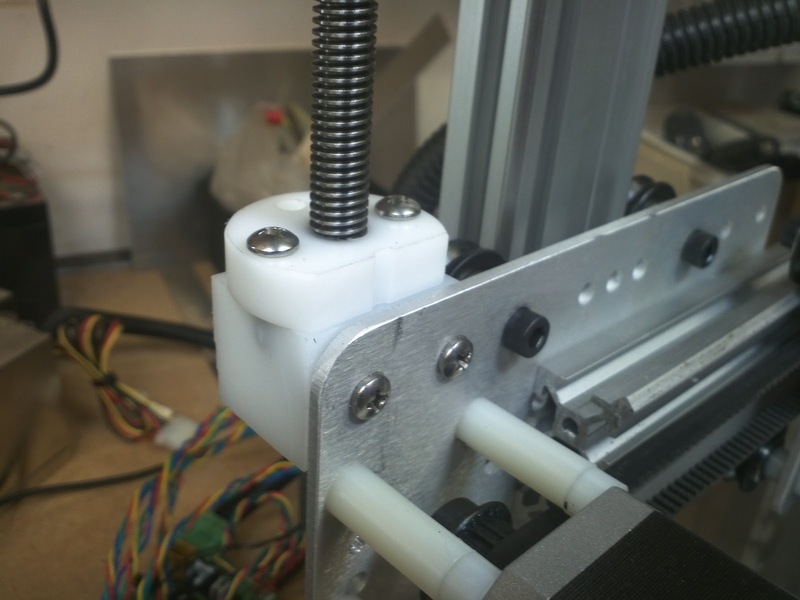 The farther away the print head is from the linear motion element, the higher the resolution. This is just looking at one arm... When the print head is in an area of higher resolution of one arm, it’s at lower resolution of the other arms, and visa-versa. If anybody has a good way of describing the resolution, please let me know. I'm on the fence about this, but I think it's worth considering, depending on your environment. Slic3r is one of several applications that takes a 3D model and converts it to a set of instruction for a 3D printer. randomize starting points across layers -- preventing a bump when the starting/ending point is the same. automatically adding perimeters as needed -- I've had problems with printing the tops of spheres. Shawn Wallace of Make Magazine put together these great 3D Printer Trading Cards! Quick view of the ORDish Bot at Maker Faire 2012 before opening. After printing out a 20mm calibration cube that was only 16mm high, I realized that I'm loosing Z steps -- the Pololu motor drivers have an adjustable current setting, and I'm guessing that while things worked before, it must have been right on the border. Moving the additional mass of the bigger ACME screws caused the drivers to overheat and miss steps. Adding a fan blowing over the RAMPS board seems to work for now. 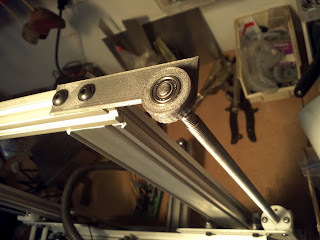 Upgraded the Z axis to ACME lead screws and added supports for the top of the rods. I wasn't happy with a periodic distortion along Z in prints, and I could see that one of the threaded rods had a small amount of wobble. Cloud9 IDE now supports Node 0.6! Node v0.5 got rid of require.paths, which was used in Cloud9. It's been possible to work around this, but a pain.